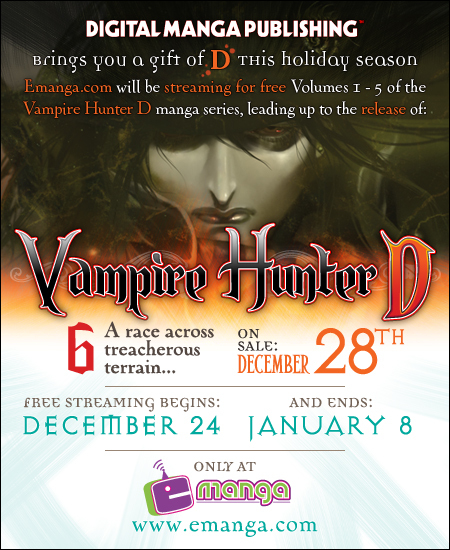 For a Limited Time Only Read Vampire Hunter D for Free! Ever since its release in 1983, Vampire Hunter D has been legendary in the world of vampires. Starting off as a series of Japanese novels written by Hideyuki Kikuchi and illustrated by Yoshitaka Amano, Vampire Hunter D grew so much in popularity it spawned films, American comics, short stories, art books and manga. For a limited time only, fans and newcomers are welcome to read the first five volumes of said manga for free online thanks to eManga. In honor of the recent release of Vampire Hunter D Vol. 6, eManga is offering free streaming of the previous five volumes of this excellent manga until January 8. Find Vol. 1-5 HERE in both English and French. I highly suggest checking them out, itâs a fantastic manga, and eManga is one of the rare few to offer easy streaming. Iâve read digital comics and manga on other sites and it was a royal pain because of their ridiculous streaming setup, but this site is awesome. Any Vampire Hunter D fans here? What do you think of the manga adaptation? Vampire Hunter D Blog » VHD featured on Vampires.com! !